Ceri Richards, a Welsh painter, printmaker and stage designer. He studied at Swansea School of Art from 1921 to 1924 and at the Royal College of Art from 1924 to 1927. Having drawn images on sculptural themes from c. 1931, Richards exhibited with the Surrealist group at the London Gallery in 1936. After election to the London Group (1937), he began exhibiting relief-constructions. From 1940 to 1944 Richards ran the painting department at Cardiff School of Art; he was also commissioned by the Ministry of Information to make drawings of South Wales tin-plate workers. A commission to illustrate the poem The Force that through the Green Fuse (1933) by Dylan Thomas for Poetry London in 1947, led to paintings and lithographs related to Thomas’s writings and to the work of other poets such as Vernon Watkins. His commissions as a stage designer included the décor and costumes for Lennox Berkeley’s opera Ruth (1956) and for Benjamin Britten’s Noyes Fludde (1958). Richards’s other design projects included the tabernacle, reredos and two stained-glass windows for the Metropolitan Cathedral, Liverpool (consecrated 1967). 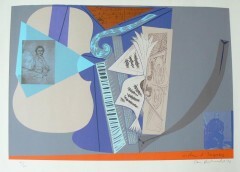 Music was a theme of Richards’s post-war work. The Cycle of Nature paintings (from 1944), with their powerful rhythms and metamorphic sexualised forms, perhaps characterize best what Richards himself saw as a Celtic element in his work, with a ‘basis in proliferation and metaphor’.